I’m trying a garden in our new climate even though I have bugs and kids and a dog working against me. Not to mention the possibility of hail, hurricanes, and tornadoes. (Because when they say, “Everything’s bigger in Texas,” what they really mean is, “Everything is more terrifying.”) But I’m trying to grow a garden in spite of the odds working against me. I have dreams of vine ripe tomatoes, the taste of summer and sunshine and joy. I’m not what you’d call a green thumb. I mean, I can keep some plants alive, specifically plants that don’t require a lot of maintenance. But I always assume it’s in my blood and that things should thrive as soon as I turn my back. My mom has gorgeous flowers and shrubbery around her yard. She says that my grandpa could put a stick in the ground and get it to grow. So I’m always a little surprised when I discover a shriveled up plant in my pot. A few weeks ago I broke a green pepper plant as I was transplanting it to a sunnier spot. I didn’t discover the break until it was already in the ground. For several days it hung by just a few fibers, the leafy top half of the stem lying on the ground. I figured I’d buy a replacement the next time I was out and about. But the top portion didn’t shrivel up and die like I expected. I mean, I know what that looks like. The leaves fold in on themselves, the whole thing browns up, and with a satisfying crunch it breaks into a million pieces to be scattered in the wind. This funny pepper plant still held onto its vibrant green. For two weeks I left it. I couldn’t really justify buying a replacement. Not if this one was still willing to fight. The inevitable happened and I came out one day to find the top portion of my pepper plant completely severed. I don’t know what finally caused the break. Pick from the list of forces that don’t care if I have a garden or not. Surely this was the end for this poor plant. I mean what else was keeping this thing alive? On a whim I remembered Grandpa, poked a hole in the dirt with my finger, and stuck the leafy portion in the ground next to its naked stem. I promised myself to buy a replacement the next time I went to the store. That was a week ago. Both portions are still alive. I’m not sure what to make of that. It won’t shrivel up and die. I almost wish it would. Then I could buy a new plant that would be so much further along than this crazy plant. But I can’t bring myself to toss it out if it’s still willing to try. This morning my ridiculous little pepper plant had grown. Both portions. Even the stem portion is no longer naked. It has a few tender leaves growing near the top. 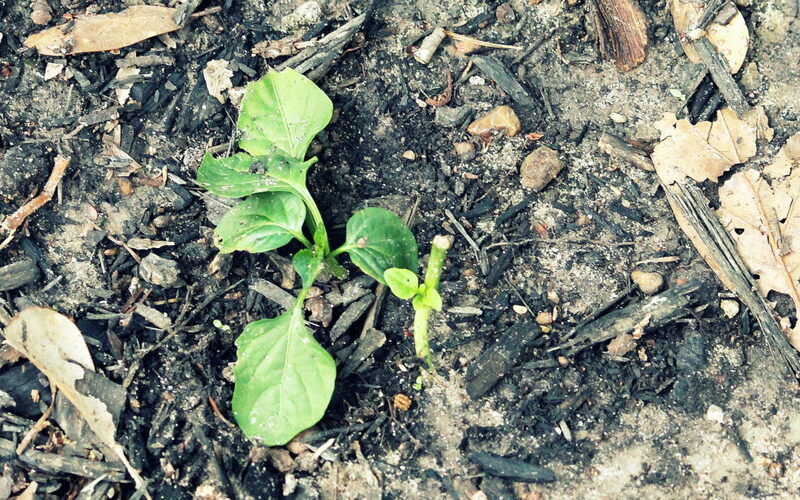 If I’d known they were actually going to survive I would have planted them further apart. If this pepper plant wants to grow with the big boys then let’s be honest, it needs to do so without my help. I’ve done zero babying for this little thing. It’s so far behind the other plants in the garden, I don’t have high expectations for it. But it keeps surprising me so I’ll continue to provide space for it to grow. Your pepper plant is a metaphor for life: we’ve gotta give it room for growth.